I love this colour combination. Yep, definitely need to go on the hunt for a mustard chair. My kitchen is slightly more green than greige, but it would definitely still work. 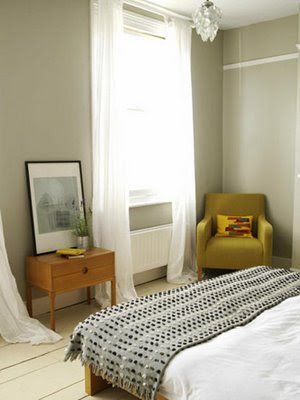 Photo from Living Etc, via Decor Addict. Mmmm...drool. Love the color on the walls, love the chair. Everything about this room is perfection! Very clean and fresh, I love the pop of colour!! I just love your taste! I am obsessed with vintage chairs myself. Love the wall colour. Lack of pictures on the walls is refreshing! Please can I have that room? I still love it! I know gray and mustard has been done and done this year but I can't get enough!